We may only see the lightning during the rainy season. However, if you live in a region in Venezuela, where the Catatumbo River meets with the Lake Maracaibo, we will be able to see lightning almost every day. In these places, there is an amazing natural phenomenon dubbed the "storm of all time" or Relampago del Catatumbo. By the storm, lightning occurs far more frequently than in other areas. According to scientists, there lightning occurred during 160 nights of the year up to 10 hours overnight. Per hour, there are approximately 230 lightning that occurred. Thus, in a year there are 1.2 million lightning. Lightning or flashes of light that are so bright that could be seen from a distance of about 400 kilometers. In the past, sailors in the Caribbean use lightning as the navigation help. Unique, lightning in the Venezuelan territory has a varied color, ranging red to orange and blue to purple. The color variations depends on the amount of dust that contained in the atmosphere. In the past, people thought that lightning in the region is also unique in that it does not produce thunder or roar. However, the assumption was wrong. 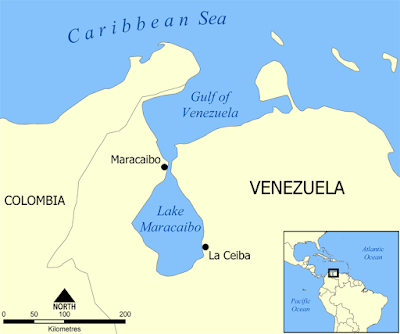 Lightning occurs on the territory of 50-100 km from Lake Maracaibo. The thunder difficult to hear if the distance of lightning sources over 25 kilometers. 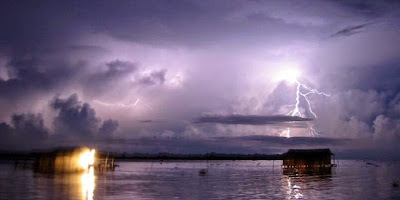 Catatumbo's lightning also gave an inspiration for literary works. A Spanish poet Lope de La Vega wrote a poem entitled "The Dragontea" in 1597, that describing Sir Francis Drake's efforts to passing through Lake Maracaibo in 1595 but thwarted by lightning. Although it has been known for a long time, until now scientists have not been able to solve the cause of the Catatumbo lightning. Yukpa people, indigenous people on the border of Colombia and Venezuela, said that the Catatumbo lightning caused by the fireflies which entered the ancestral spirits. A number of scientists who visit the Catatumbo region to decipher the mechanisms behind this special lightning. Melchor Bravo Centeno said that the lightning may be caused by a closed wind circulation occurring in the region. Unique topographic of the Catatumbo region, where there are two mountain walls that limit the three sides of the Lake Maracaibo region. During summer, moist air flows from the Caribbean to Maracaibo from the side that is not restricted by a mountain. Air was then met with the cooler air of the Andes mountains and pushed upwards. Water vapor and began condensed, forming clouds that then release electricity and generate lightning. The whole process was not separated from the water cycle in Lake Maracaibo. The lake's water evaporated due to the sunlight heat of equatorial region. Then the water vapor becomes the storm fuel. Andrew Zavrotsky, a Venezuelan scientist who visit Catatumbo several times. He found three places as the center of lightning, ie at the swamp of Juan Manuel de Aguas National Park, Claras Aguas Negras, and a location in the west of the lake. Zavrotsky also revealed that the uranium found in rocks in the Catatumbo region may contribute to the occurrence of lightning. However, this hypothesis has not been proven scientifically.